When most people think of weddings, they envision lovely, lavish flower arrangements. But, believe it or not, some brides simply don’t like or want flowers. They may be allergic to certain kinds of flowers. They may want a nontraditional wedding without the huge traditional flower centerpieces and arrangements. Or they want to maintain a minimalistic, fresh and modern look for their wedding ceremony. You can purchase fish from your local pet store or breeder, and then give them to guests as gifts after the wedding. Or you may even be able to “rent” the fish from the retailer and then return them after the wedding. 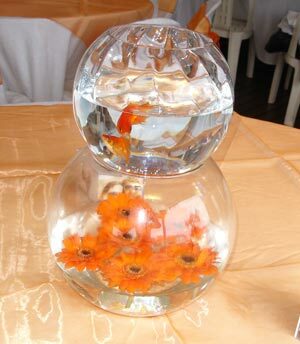 Floral décor, is completely optional, you can mix your fishbowls with coordinating glassware of floating gerberas or other flowers. A bucket, dechlorinating drops, fish food, oxygen tablets and a small fish net. Mix dechlorinating drops with fresh water (follow instructions on the packaging) to remove chlorine from the water, which can kill the fish. Fill each container half full of water from the bag containing each fish and half with the dechlorinated water. Add oxygen tablets to each bowl. Feed the fish a small amount of food just before the wedding and then again after the wedding. If your guest tables will be lavishly furnished with embossed table cloths, runners and gifts, focus on crystals, candles and candelabras rather than elaborate flower arrangements for your table decor. Consider simple dessert dishes as an elegant finishing touch as we did at a recent wedding. You can use any flower of your choice: gerberas, orchids or lilies, for example. Add some ivy, which is a symbol of fidelity, friendship and affection. Or add in some baby’s breath, a sign of sincerity and innocence. 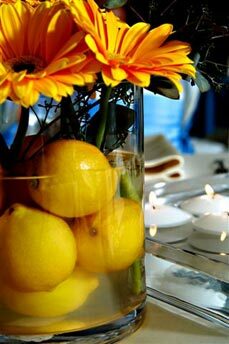 By combining flowers with some texture, you create table centerpieces that are not simply beautiful but also meaningful. TIP: When using lilies such as Casablancas, St. Josephs or Stargazers, remove the stamens from each bloom. Doing so will prolong the life of each flower, can prevent allergies and will eliminate staining of the flower or tablecloth. The bright colors of fruit beautifully complement wedding color themes today. And they can work well with flowers, if you want an extra dash of color. For example, we placed shiny, juicy-green apples in a cylinder vase with three or four bright-colored gerberas tied with ribbon. Instead of turning to the long, flat, traditional “coffin-spray” types of floral arrangements for the bridal party’s table, jazz up the décor with a modern feel using mirrored boxes and silver boat dishes. For smaller main tables we combined white roses and baby’s breath with funky orange gerberas in the shiny, sophisticated boxes. For a larger bridal party, with a longer table, we had lacey runners beneath each arrangement rounded off with votives, candles and individual lily blooms. A bridal bouquet with no flowers? At one wedding, our bride refused to have flowers in her bouquet. We tried to convince her to add just a few, but she didn’t bite. We did, however, persuade her to include some roses in the bridesmaid’s bouquet. The result turned out to be something quite special and unique that used a mix of fantastical buttons and crystals. This could be a project you can start long before your wedding day, collecting buttons, beads and other trinkets far in advance. Then, like our bride, you will easily be incorporating the “something old” tradition into your wedding; for this bride, that came in the form of using some buttons which came from her granny. No matter what unusual items you include, you’ll definitely create a bouquet you can keep forever. In considering the suggestions here, always keep in mind that your wedding day is your day. No matter whether you want flowers or not or whether your ideas might be a little off the wall, all you need is a wedding florist with vision that will help make your dreams or ideas a reality. This is such a brilliant article and amazing ideas! 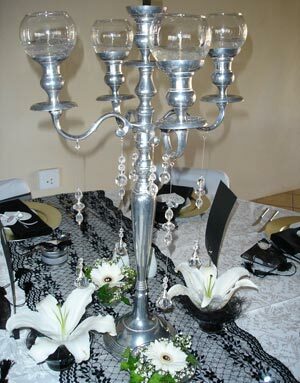 I would never have thought of doing table decorations that are so elegant looking. Well done Lize, I see that you have definitely found your calling. What fabulously creative solutions! It’s hard for me to imagine a bride NOT wanting flowers at her wedding, but I love how you were able to convince her to include them anyway. And for the bride who is really one-of-a-kind (and who doesn’t want to think SHE is that bride? ), mixing in the beautiful fish and fruit is genius in allowing her to show her personality! (And, of course, the crystals and silver-plated boxes create a completely glam event!) I’d be hardpressed to choose which concept is my favorite! Bravo! g.
How creative! I’m sure her guess not only enjoyed the fish and flower displays, but it have them talking for years later about how the bride’s wedding was so different and matched her personality. Thanks for the positive comment! I think weddings that has something unique will always be remembered and we’re grateful as florists that we can turn the brides ideas into something unforgettable and special! I love the modern flare! Thanks for sharing and posting! Thanks Leslie! It’s only a pleasure! Thanks for the comment, glad you enjoyed the ideas! Yes, the button idea is definitely something special!